8-OHdG Check is a competitive enzyme-linked immunosorbent assay for quantitative measurement of the oxidative DNA adduct 8-hydroxy-2'-deoxyguanosine (8-OHdG) in DNA in tissue, urine and so on. 1. Easy operation: There is no need for expensive equipments and sample pretreatment. 2. Highly sensitive: Monoclonal antibody recognizes 8-OHdG specifically (21 analogues of 8-OHdG do not have any cross reactivity). 3. Speedy: Estimated time of assay is 3.5 to 4 hours. 4. 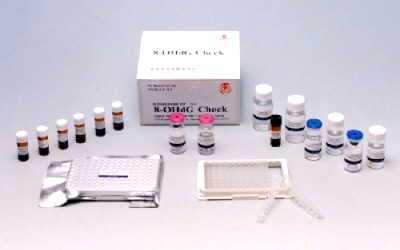 Sample capacity of one kit with blank and standard is 18 for triplicate samples. Only 150µl of sample is required (50µl per well). 5. The use of split type microplate prevents the waste of test samples. In a primary evaluation of individual life style; in general, to learn whether individual antioxidant system are controlling properly excess active oxygen generated inside body and whether the oxidative stress is restrained within manageable limit, so that whether individual life style is in a state to prevent from diseases and to aging to enjoy the individual maximum life span. In assessing the effect of antioxidant substance (food) in vivo. In evaluating how much oxidative stress is generated by exercises performed or specific activities to which body is subjected to. In studying the correlation between disease and oxidative stress. In determining the side effect of oxidative stress following a specific clinical treatment procedure or pharmaceutical dose of medicine.